Sunday Silence completed an inauspicious 2-year-old season with one victory in three starts. 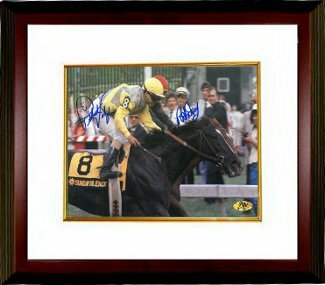 Sunday Silence matured dramatically between two and three years old and began his 3-year-old season and suddenly put himself front and center for the Triple Crown. Sunday Silence prevailed against Easy Goer by a nose after a thrilling Preakness stretch duel, most observers credited Pat Valenzuela with outriding Pat Day, who later admitted he would have done things differently. Easy Goer then denied Sunday Silence's bid for the Triple Crown with an eight-length romp at his home course in the Belmont Stakes. This 8x10 Photo from that photo finish at the Preakness at Pimlico is signed by both jockeys Pay Valenzuela and Pat Day. Private Signing 7/31/2013 & 8/1/2013 in Rosemont, IL. MAB Hologram and Certificate of Authenticity from Athlon Sports. Custom White Mat and Premium Mahogany Frame as shown.